With a Chrome Pocket Handle, Anti-fingerprint Finish and 668 litres of capacity, enjoy the convenience and storage of this Side by Side refrigerator.The design of the water and ice dispenser makes it easy to fill tall containers. Digital controls make it easy to see the fridge settings and the child lock provides added protection against accidental spills.Enjoy the convenience of ice & water without the need to have the refrigerator connected to your water supply. Inside the refrigerator is a water canister which can be removed for easy fillings. The LG GSL668PNL Refrigerator was added to the Refrigerators category in September 2016. 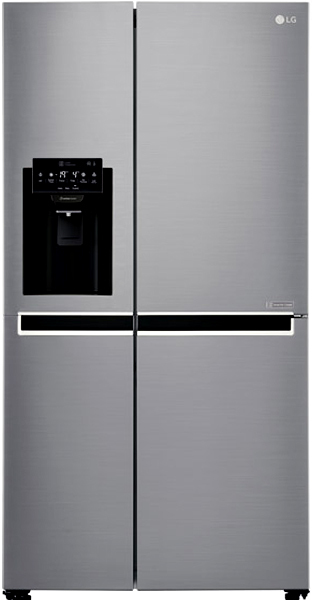 The lowest price GetPrice has found for the LG GSL668PNL Refrigerator in Australia is $1,720.00 from Appliance Central. Other merchants who stock it are Appliance Central, Billy Guyatts, R.T.Edwards QLD, Bing Lee, Appliances Online.